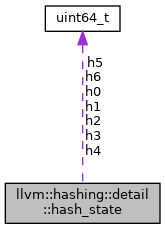 The intermediate state used during hashing. Currently, the algorithm for computing hash codes is based on CityHash and keeps 56 bytes of arbitrary state. Definition at line 259 of file Hashing.h. Create a new hash_state structure and initialize it based on the seed and the first 64-byte chunk. This effectively performs the initial mix. Definition at line 265 of file Hashing.h. References h4, h5, h6, llvm::hashing::detail::hash_16_bytes(), llvm::hashing::detail::k1, mix(), rotate, and llvm::hashing::detail::shift_mix(). Referenced by llvm::hashing::detail::hash_combine_recursive_helper::combine_data(), and llvm::hashing::detail::hash_combine_range_impl(). Compute the final 64-bit hash code value based on the current state and the length of bytes hashed. Definition at line 306 of file Hashing.h. References llvm::hashing::detail::fixed_seed_override, llvm::hashing::detail::hash_16_bytes(), and llvm::hashing::detail::shift_mix(). Referenced by llvm::hashing::detail::hash_combine_recursive_helper::combine(), and llvm::hashing::detail::hash_combine_range_impl(). Mix in a 64-byte buffer of data. We mix all 64 bytes even when the chunk length is smaller, but we record the actual length. Definition at line 289 of file Hashing.h. References llvm::hashing::detail::fetch64(), llvm::hashing::detail::k1, rotate, and std::swap(). Referenced by llvm::hashing::detail::hash_combine_recursive_helper::combine(), llvm::hashing::detail::hash_combine_recursive_helper::combine_data(), create(), and llvm::hashing::detail::hash_combine_range_impl(). Mix 32-bytes from the input sequence into the 16-bytes of 'a' and 'b', including whatever is already in 'a' and 'b'. Definition at line 276 of file Hashing.h. Definition at line 260 of file Hashing.h.